We teach kids and youth programming! During our classes students aged 8 to 15 years are creating their own games, animations and programs. We start by teaching them simple block languages and end up with introducing advanced tools being used in companies like Google or Apple. 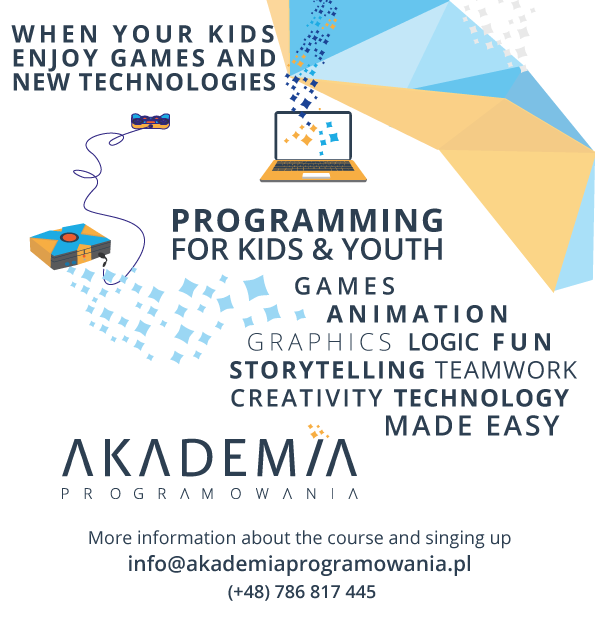 We are the first company in Poland providing this kind of education for children – our program is being developed and implemented since 2013. We teach according to a syllabus created by us – we use the best tools to implement practical knowledge. First, we start with simple block languages like Scratch MIT and finish with professional languages like Java or Python (specialized courses). Our teaching plan has been appreciated by international partners and is currently being used to teach kids in Indonesia! Our team consists of young professionals with both hard and soft skills – we teach practical programming knowledge while using psychological and pedagogical experience. All instructors are trained by carefully selected trainers and have first aid certificates. The beginners course lasts 2semesters (11-15yrs) or 4 semesters (8-10yrs). We cover programming tools like Scratch, Alice 3D, Stencyl. Students work in pairs – we implement a method called pair programming which improves social skills.